Once I have an idea of how much handspun I need for a particular project, I can measure whether I have enough on hand, or if I need to spin more. There are a several ways to do this. One way is to use a McMorrin Yarn Balance, a handy gadget which calculates the length of a yarn based on its weight. Laritza at Yorksett Arts & Crafts wrote an excellent tutorial on that, which you can read here. I calculate the yardage of my handspun with a yardstick and some simple math. 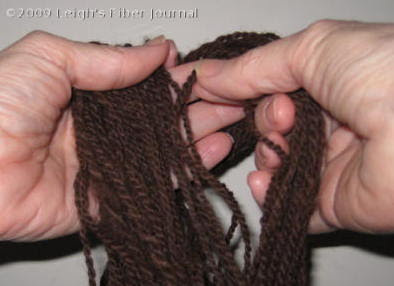 The skein in this photo measures 20 inches. Of course, the skein is actually a loop, or circle of yarn, so what I really want here is the measurement of the yarn all the way around. To find that, I double the measurement, and get 40 inches. Next I count the strands of yarn in the skein. For this skein there are 96. I divide that number by 36 to get the yards. In this case, 106.66 yards. If I need to round any numbers, I always round down, to give myself a safe minimum amount of yarn. I do this with each skein and total up the yardage. If my spinning were more consistant, I could probably just use an average for each skein, but it isn't, so I don't. So far, I have spun a little over 728 yards of 2-ply pol-paca yarn, so I'm close to a fifth of the way to the yards of handspun I need for the Turkish coat. Even so, I could use some of this to start sampling on the loom, as I need to finalize the weave structure and pattern, as well as sett and shrinkage from wet finishing. Since I have plenty of both Polwarth and Alpaca, I can sample to my heart's content. Obviously this method can be used for knitting and crochet projects as well. You may recall the complex calculations that went into trying to figure out if I had enough various colors of yarn for my Shetland Sampler Cardigan. This post describes how I calculated that, and this post describes how I calculated for the cuffs and bands. This is not a project I'm in a hurry on, so progress may be slow. At the moment, I'm just happy to be spinning for it. So for now, I'll spin on. I measure my yarns exactly the same way! there are also gadgets around, where you can lead your yarn through to measure each skein - when winding it into balls etc. but I always think that people managed to do fantastic work without all those gizmos over centuries (more like millenia!) and try to invest only in really necessary tools... and more fibres instead:)) happy spinning! This is really a smart method to measure yarn length! I have a large box of handspun yarn lying in a cupboard, perhaps I should start using it? Oh dear, I do hope someone gifts you with a yardage counter come Christmas........ With it you can count the yardage at the same time you skein the yarn (or wind the yarn onto a cone or wind it into a ball). And as I think of your thriftiness, you could easily find out the yardage on small leftover skeins or cones of yarn which would facilitate your ability to use them. You can also wind off the necessary amount of white yarn for dyeing. I'm afraid I consider a yarn counter an absolute necessity! I've been measuring mine on the Niddy Noddy and didn't think about it might shrink when washed. I will now try the ruler. I didn't know there was such a thing as a yarn counter. I've used the McMorrin Yarn Balance because I always full my skeins first. I'd measure about four samples and then average them because of the fluctuation in my results due to spinning imperfections. Now I want a yarn counter. I measure mine the same way but after its been washed. I use my McMorrin Yarn Balance when I have left over yarn on cones. Once I find the yards per pound weight the cone of yarn on a scale subtracting an ounce for the cone. I have a yarn counter I hardly ever used. I suppopse everyone has their favorite method of counting the yardage. Leigh, I assume this is because of the shrinkage factor. I understand. But I store my handspun in skeins and I need to have a rough idea of how much I have in order to plan a weaving project, whether I want to plan it around a particular yarn(s) or whether I am simply looking through my stash to see if I have enough of something that might work. I guestimate 10% shrinkage, but I have never actually tested. If, on the other hand, I would be spinning for a particular project, as you are, I definitely would wait to measure until I was winding the washed skeins onto cones or into balls. I'm not sure I would be at all accurate without a counter, since my skeins are anywhere from 300 to 400 yards long. I would definitely not be accurate with 60/2 silk skeins! Another great post! Thank you! I have a custom made Nod that allows for the "shrinkage" factor. At least I know I'm "over" the estimate count. My Weekend: "Cotton & the Charkha"